Just a Mess is another Little Critter book by Mercer Mayer. Like most of the series, this story describes a very ordinary childhood occurrence/bit of mischief. When our hero can't find his baseball mitt, his mother tells him to clean his room. Rather than properly doing so, he frantically stuffs all his mess into his closet, under his bed, or in his toy chest. In his foolhardy haste, however, he manages to loose something important--his pillow. Though this would seem to be the opening for him to sort through all his junk and redo his abysmal cleaning job, instead he finds what he was looking for at the outset--his mitt. This apparently makes everything okay. Though amusing, it bothers me that this kid doesn't seem to learn at all from his mistakes, nor is much guidance offered by his parents in the story. Thus, these stories are purely for amusement only and require a lot of discussion to turn them into good lessons. Even though I enjoyed these books as a child, I'm becoming less and less enthralled with them the more we read. Still, the illustrations are nicely detailed and most kids will probably get a laugh. Suitable for early readers grades 1-2. Published in 2010, The Berenstain Bears' Neighbor in Need is a nice story about public service and lending a helping hand. Brother and Sister Bear, along with a few friends, are Good Deed Scouts. Today's job is helping out an older neighbor (also their sometimes babysitter) who is mowing the lawn in a long sweater dress. After they mow the lawn, Mrs. Grizzle comes up with a myriad of chores both inside and out of her house, including walking the energetic dog and giving a cat a bath. As a reward, Mrs. Grizzle wows them with magic tricks and sends them home with flowers for Mom. As always, it's a well-written, nicely illustrated, enjoyable book. One thing that struck me as unusual is the plethora of religious, specifically Christian references in the store. Quotes from the New Testament and references to dictates of the Bible are frequent. Perhaps this represents evolution of the Berenstain franchise--the story is written by Jan and Mike Berenstain which might be the explanation. Either way, I don't know whether the religious references bother me, per se, but they were decidedly unexpected. Appropriate for early readers grades 1-3. My next appointment is July 11 with my regular provider. Wow, I guess I've fallen behind again on my kids book reviews. I was out of town for nearly a week, then have been focused on finishing up a number of projects before the Blueberry arrives. 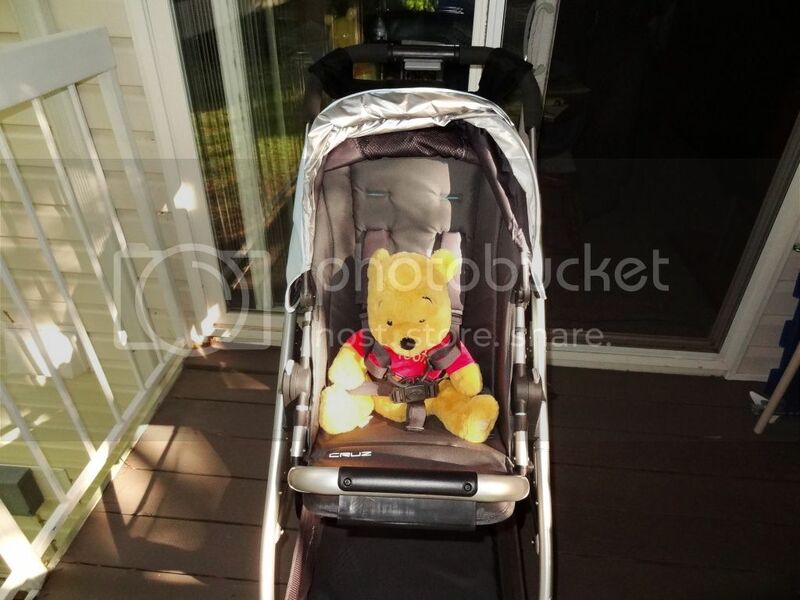 For example, this evening we installed the car seat! I still have to get our installation inspected, but it seems fairly secure. 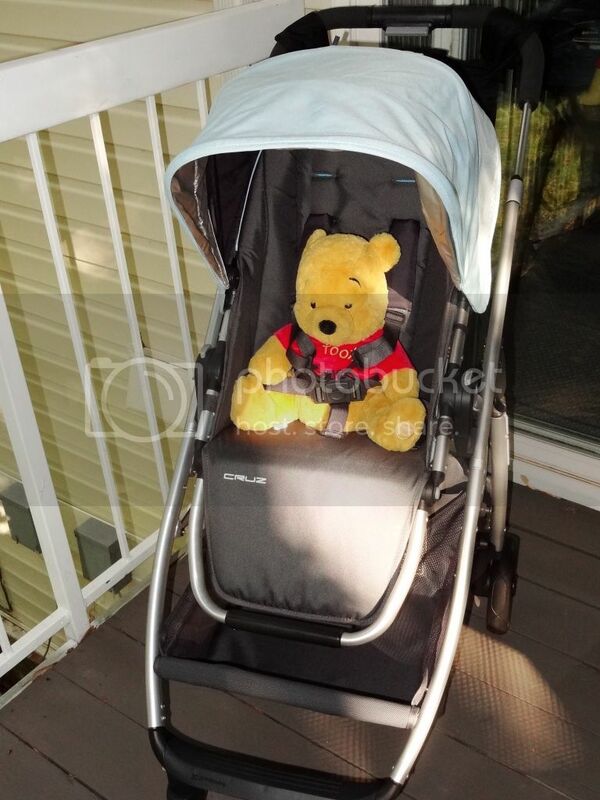 Pooh, once again, modeled it and seemed comfortable enough. On to the book. . .
Just Shopping With Mom is another Little Critter book by Mercer Mayer. I thought it was more recent than it is--published in 1989, this tale features our hero shopping in a grocery store with his Mom, little sister, and baby brother (?). This tale is more a reminder to parents to avoid taking your children, particular multiple kids to the market if you can help it. As big brother, our hero is tasked with attempting to keep his siblings out of trouble. However, the little ones--little sister especially--is a huge handful. She throws a fit over candy, destroys displays, and even scampers off when told to stay put. For the most part, big brother is well-behaved although he echoes his sister's demands for ice cream at one point. Once their errands are finished, then the whole family finally enjoys ice cream. I can't say that this story is terribly original and there's definitely not character growth or a lesson for our hero. Still, the illustrations are beautifully detailed and are colorful. Suitable for early readers grades 1-3. 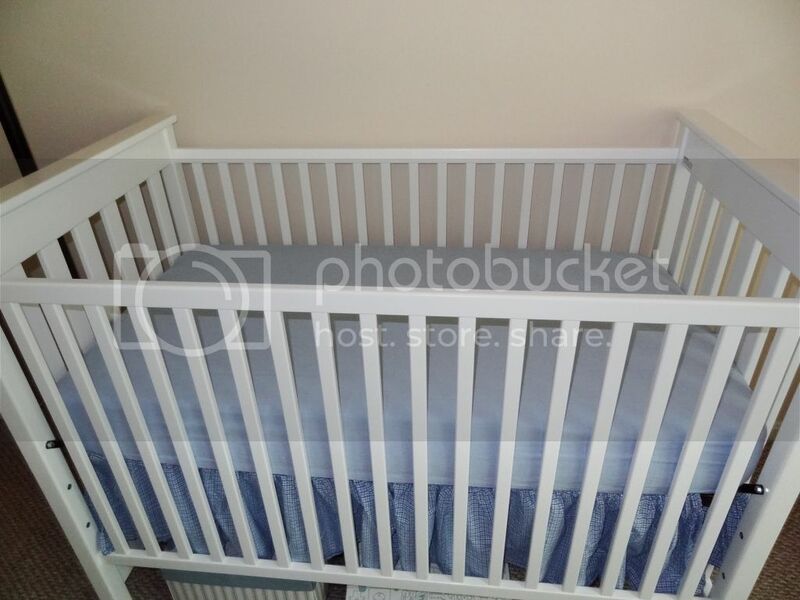 Although I built the Blueberry's crib at the same time I as built his dresser, I didn't get around to washing the bedding and decking it out until later. 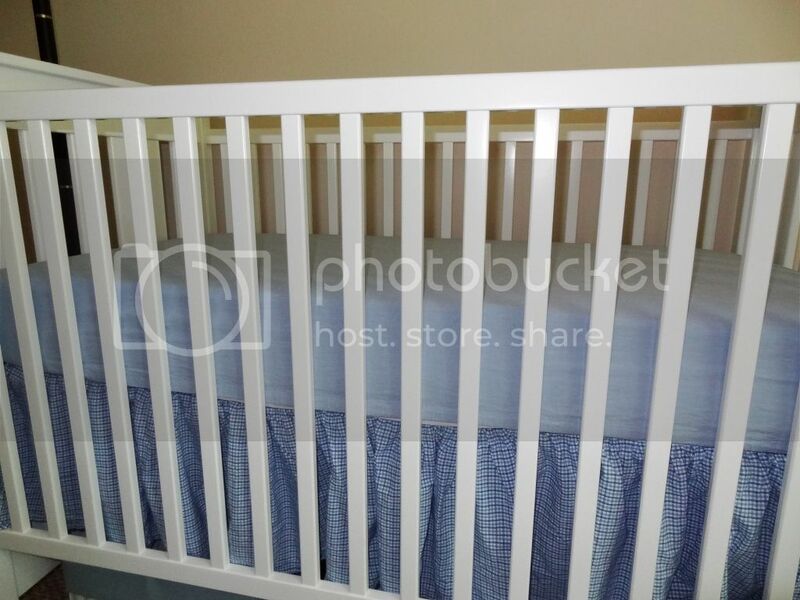 Here are pictures with a blue bedding set--I have a couple other sheets which will pair either with this bed skirt or a white eyelet skirt. 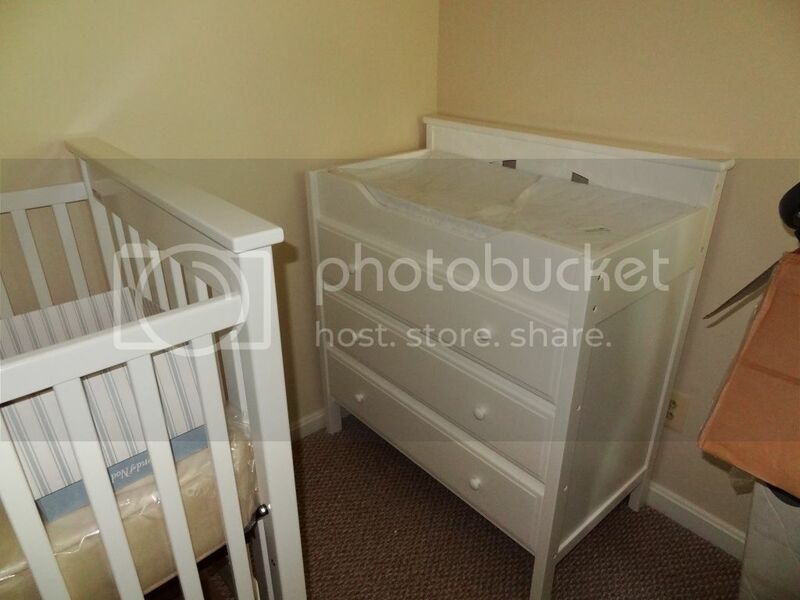 I selected the Straight Up Crib in white from Land of Nod, which is where this bedding set was also purchased. Since baby's not due for another month and a half, I've covered the entire crib with a sheet to keep the dust off until he arrives. Once I decorate the walls, I'll be sure to uncover it briefly for pictures. 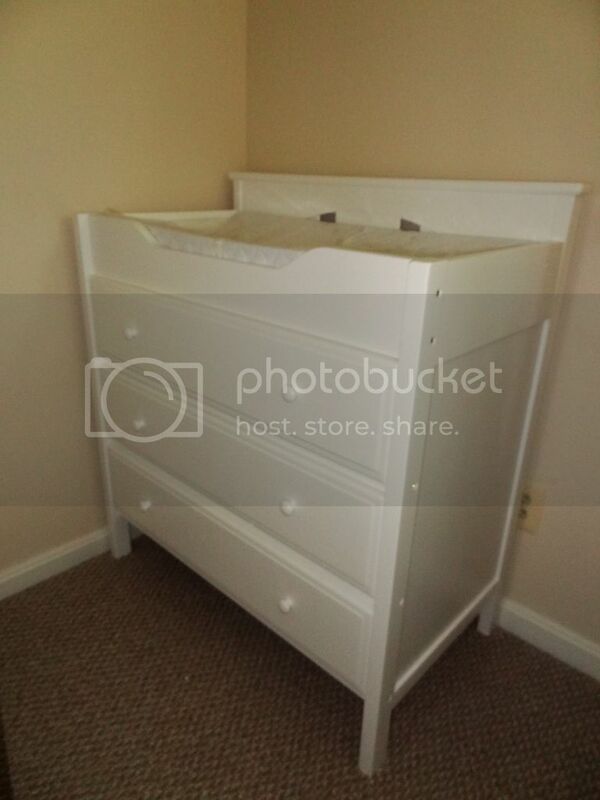 Behind it, you can see the matching changing table cover! Edward in Deep Water by Rosemary Wells is part of a series called "Edward the Unready." Apparantly designed to reassure children who might be a little insecure and possibly slower in development than their peers. In this story, Edward is invited to a swim party--possibly his first party. Though his parents try to warn him that the other children his age may no longer use water wings, Edward insists on wearing his wings to the party. When two girls playfully tease him and pop his water wings, Edward soon discovers that he's a bit over his head at this party. The two playful girls cause him to fall in the pool, without his water wings, where he must be rescued by a lifeguard. Later, the lifeguard informs Edward's parents they he many not be ready for this sort of party. Edward receives a new pair of water wings and is happy again. I missed the little "Edward the Unready" logo in the corner of the book at first, so I was a little surprised by how the story progressed. I was expecting Edward to gather his courage and realize that he would be perfectly fine without his wings. I suppose there is a great value in reminding kids that everyone matures at different rates. However, I was always near the upper end of the developmental (and academic) curve, so it's hard for me to relate. It's not a bad story, but I probably wouldn't go looking for such a book in the future unless there's a "problem." Where's Bear by Hilary McKay is an adorable story about a boy and his favorite bear. What's particularly interesting about this bear is that he's a well-worn little guy. The story details how the only clean spot is beneath his chin and the rest of him is splotched with everything from grass stains to food stains to soot from under the stairs. To everyone except this little boy, his bear is absolutely disgusting. Then one day the boy's grandmother and mother devise a scheme to clean the bear. The boy is whisked out of the house for a day of errands and fun with his grandmother while his mother cleans the bear. The boy has a ball during his time with his grandmother but misses his bear. When they return home, the boy finds the clean bear on his bed. But he doesn't recognize it. The boy is sad and not comforted by the "strange" bear, at least at first. Finally, in the middle of the night, the boy embarks on a quest to find his bear. Because it's dark and the "strange" bear looks friendly, the boy takes him on his hunt. They look everywhere, including on the wet grass, in the sand box, and even under the stairs. Finally the boy falls asleep. When he wakes up, suddenly there's his old bear and the "strange bear" is gone. Together the two search for the "strange" bear for a mini repeat of the original tale. I liked this book quite a bit and for more than just the bears. It has lovely colorful illustrations and McKay's writing is most detailed. Though the writing is not very complex, the story is longer than many children's books so I guess that it's most suitable for a ready grades 2-3. Recommended. The Berenstain Bears and the Baby Chipmunk is relatively recent book (2005) featuring all three children (Brother, Sister, and Honey). In this story, Sister discovers a baby chipmunk sitting all alone in front of a tree. Once the family decides that the chipmunk is without a mother, the family adopts him. Naturally, creatures of the wild often get into mischief once brought indoors. Though it's clear that the chipmunk would probably not have survived but for the Bears' nurturing, soon it's time to let him run wild. Fortunately, however, the chipmunk's natural home appears to be the Bears' backyard. Thus, the family can see him playing with his friends every day. This story is one of the only ones I've read that wasn't written in rhyme. Though longer than most of the Berenstain books I've reviewed, the degree of difficultly seems firmly in the grades 2-3 range, if not younger. It's an enjoyable story, particularly with all the cute chipmunk antics, but won't be making my favorites list. Morris and Boris at the Circus is a funny little story with heroes Morris the Moose and Boris the Bear. If you're not familiar with this duo, Boris is the sensible one (naturally, he's a bear) while Morris is the impulsive goofy one. In this story, Morris has discovered that the circus doesn't have a moose in its lineup. Thus, off Morris goes to attempt to join the circus. However, as a moose he's not particularly qualified to do many of the skills done by other performers (e.g. be a lion tamer, walk on the tightrope, etc). But, for our amusement, he tries! Finally, his good friend Boris suggests that Morris be a clown. Though reluctant at first, soon Morris is a hit in large as a result of Boris chasing his friend around the ring because Morris (in classic clown tradition) squirts in the face with a water prop. A funny story indeed, but a long one. I doubt it will hold the attention span of kids younger than 4 or 5, because it's a little slow-moving in places, but I may be mistaken as who doesn't love a circus? As a reader, I'd guess it's appropriate for grades 1-3. If you enjoy this book, there are at least two other stories featuring these two guys: Morris and Boris and Baby Teeth and Morris and Boris at the Playground. There are also a number of books featuring just Morris. Yes, yes, I know it's June, but I LOVE the snow and couldn't resist picking up this book at the library. The Best Snowman by Margaret Nash is a charming little tale about a little boy's first experience with snow. He makes a terrific snowman in his backyard, then all his neighbors request that he make one for them as well. He goes from yard to yard making snowmen that resemble their recipients (e.g. Mr. Jones is a bit on the chubby side, so he receives a very round snowman). Finally, the boy comes to the last house but (*GASP!) there's very little snow. However, the neighbor requests a "teeny-weeny" snowman, proclaiming that they're the "best." The boy makes an appropriately small one, though he wonders why such a small guy is the best. He is soon enlightened as the neighbor places the tiny snowman in the freezer where his snowman will never melt. I've been without a real snowfall for over two years due to a series of moves. This winter I had better get my snow (and to ensure it, we're heading north). I wish I had room in my freezer to keep a snowman, but alas I never do. Nonetheless, this is a great little story and will no doubt inspire every kid to fill the freezer with snow. This book is an early reader, likely appropriate for grades 1-2. Nice colorful illustrations with bold outlining make it visually pleasing as well. Okay, since this is my third or fourth beach-related book, I definitely think I'm gravitating towards them. Maybe I'm missing the ocean or perhaps just because it's summer. The Berenstain Bears by the Sea is another cute story about a a trip to the ocean. Brother and Sister Bear can't wait to play in the water. However, Mama insists that chores must be done first. Chores?!! They're on vacation, right? Well, apparently their vacation home is a bit sandy so the cubs must work to clean it up before they may hit the water. Next, Mama insists on a nice lunch followed by an appropriate period of digestion. Finally, they hit the sand but no going in the water yet...sunscreen must be applied! At long last, the entire Bear family frolics to their heart's content in the sea. I know, I know. I've fallen behind on book reviews. We traveled to Chicago for a wonderful baby shower and it seems like I've been in baby room decorating mode ever since. However, I went to the library the other day so have got a fresh batch of books to read and share. Thomas & Friends: Henry and the Elephant introduced me to another train friend of Thomas. I think I've mentioned how I didn't become familiar with Thomas the Tank until adulthood. Thus, please forgive me as I stumble through the various characters and relationships among Thomas and his friends. In this story, Thomas has left the train yard leaving friends Henry and Gordon behind. Naturally with one engine fewer, there's more work for those remaining. At first Henry and Gordon are feeling over-worked, but then the circus comes to town! Pushing and pulling circus trains is somehow more enjoyable (we don't get a lot of details on why that's so). Abruptly, the conflict portion of the story begins--there's a blocked tunnel. Workmen enter the tunnel to clear it but are scared away by something...then they turn to Henry. Though Henry is generally scared of tunnel, he dutifully pushes trucks into the tunnel in efforts to clear it...something pushes back! As you may have guessed from the title, it's an elephant. Everyone makes friends and that's a day. 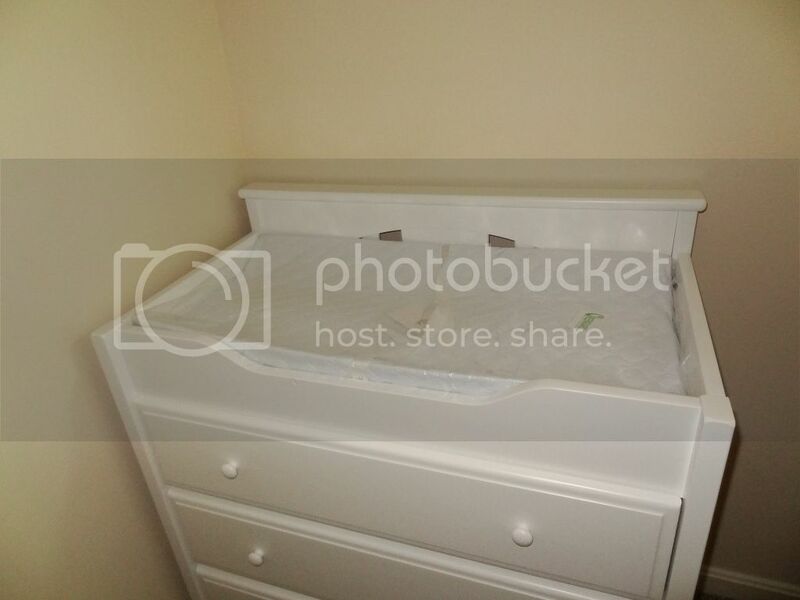 Originally I was going to purchase a more traditional changing table with open shelves and baskets. Then I started shopping. Soon it became clear that cute wicker baskets I had in mind would not accommodate, nor would they keep clean, the extensive wardrobe Blueberry would have. 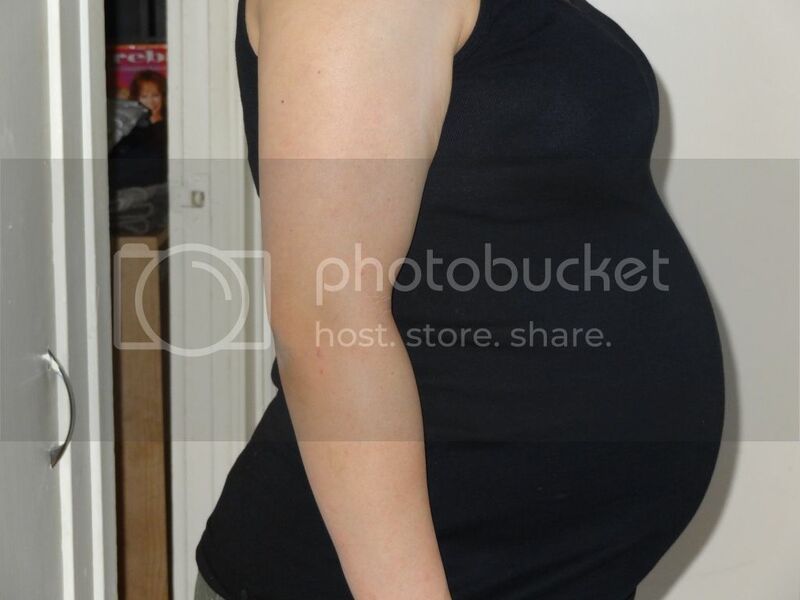 (Currently, our unborn baby has more clothes--I'd say more than double--than my husband has, especially if his uniforms are not counted.) Thus, I selected the DaVinci Roxanne 3-Drawer Changer. I wanted wood and I wanted white, so this fit the bill. For the most part it seems quite sturdy. I believe it's made of pine, so it did arrive with a tiny blemish from shipping. However, it's so small that it wasn't worth the trouble to send back. Plus, if I'm really motivated I'm sure it will sand down easily enough. Here are some pictures. Apologies for the poor lighting. 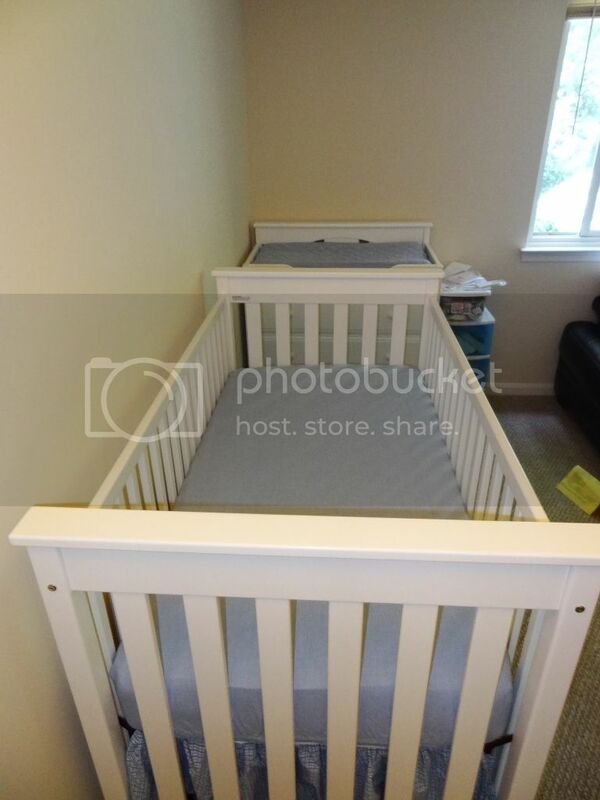 On top is the Land of Nod changing pad. We have some beautiful covers for it but they're still to be washed. It's located next to the crib so it will be a short trip during the night. As you can see, I've wasted no time filling it. 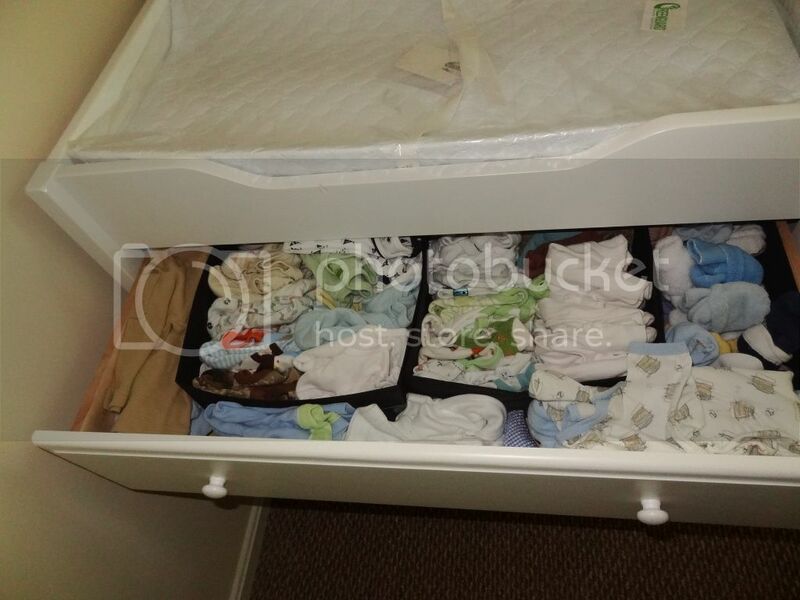 This top drawer contains socks, newborn onesies and sleepers, and 3 month onesies, shirts, pants and jumpers. It's here, it's here, it's here! And finally assembled. 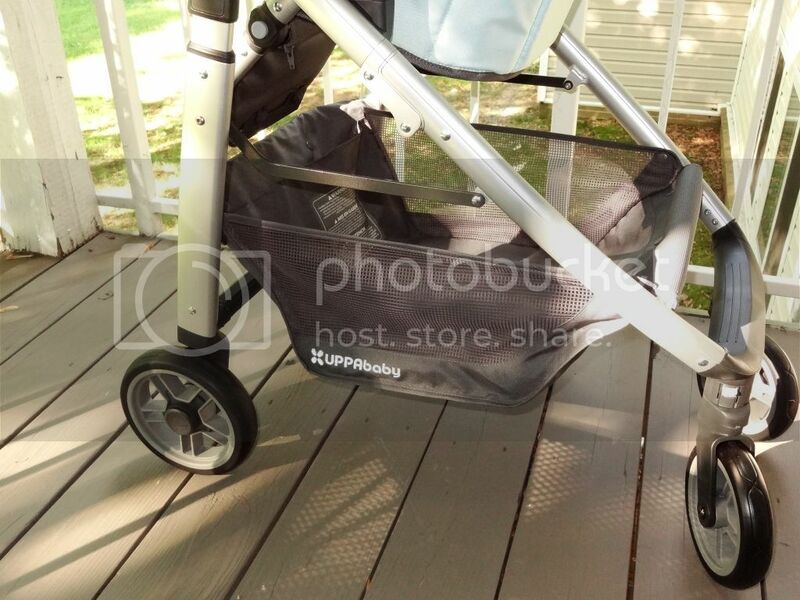 As some of you may know, I initially had my heart set on the 2012 UppaBaby Vista. 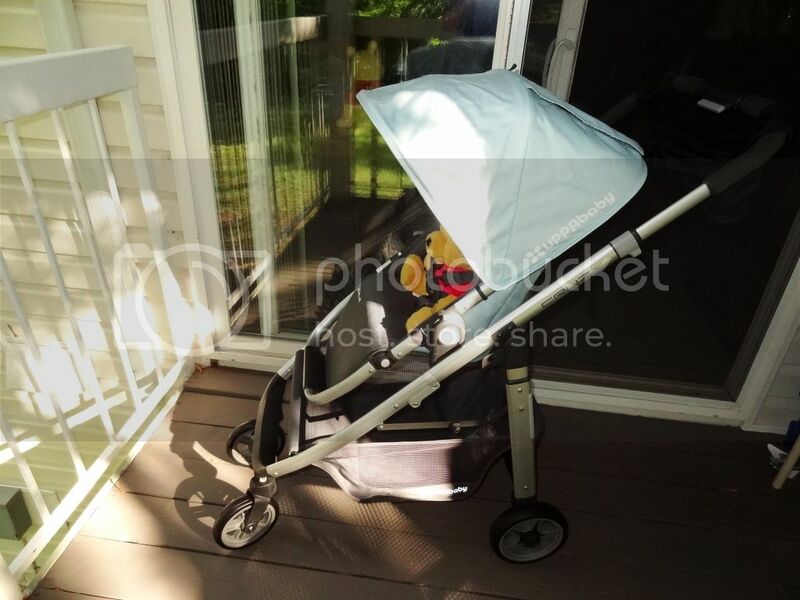 It's a fully loaded, moderately-priced luxury stroller that includes a pram. I really had my heart set on a pram for a long while. 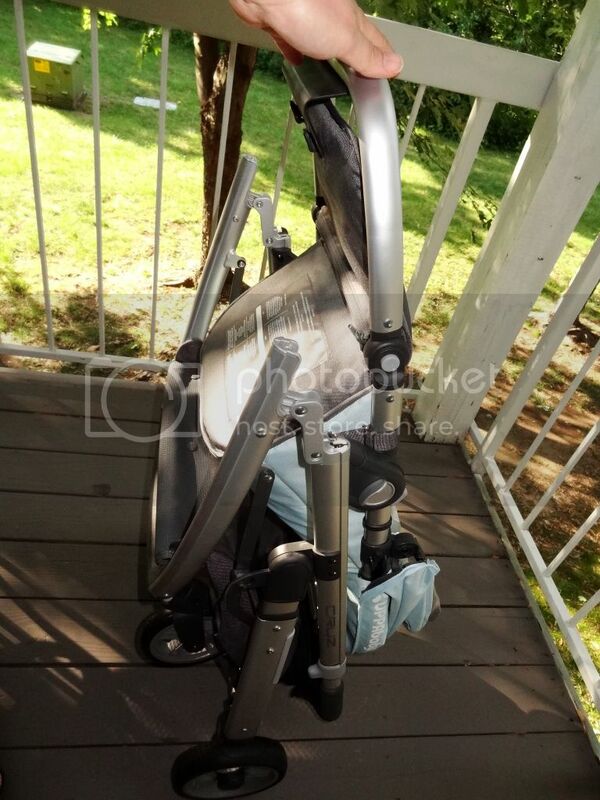 However, the Vista was $700 and there's a good chance that the Blueberry wouldn't like riding in a pram or spend any time in it at all due to a fast rate of growth or any number of other reasons. 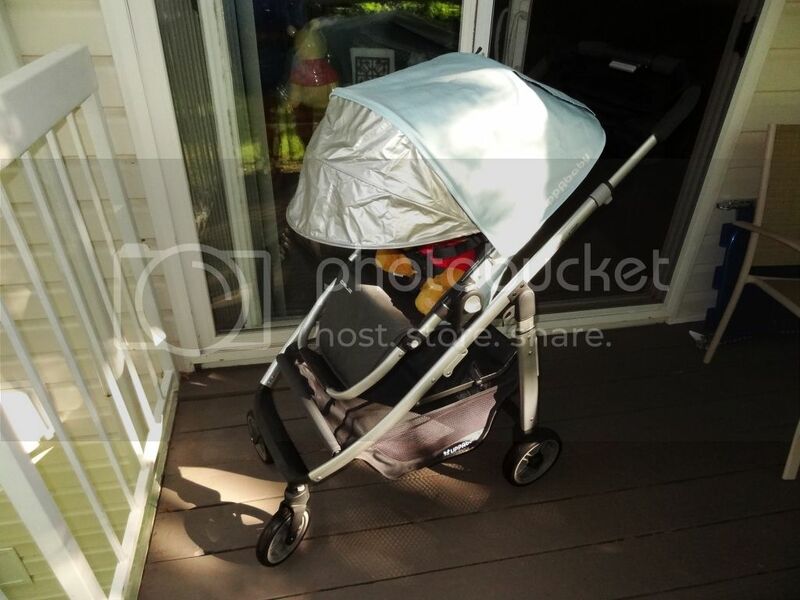 Finally, after much thought and further research into the Cruz, I decided against the bassinet (essentially a non-optional $250 accessory) and the heavier stroller that came with it. New this year, the Cruz is basically a less souped up version of the Vista, priced at $460 versus $700. 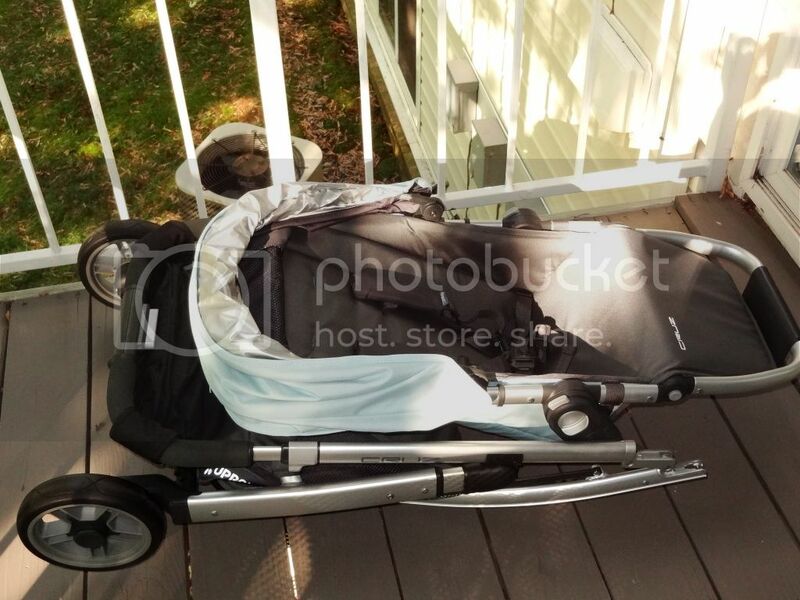 It has smaller wheels (although of the same quality rubber/foam) than the Vista, no bassinet, and currently has no bumper bar or snack tray option--these options are supposed to become available in July. 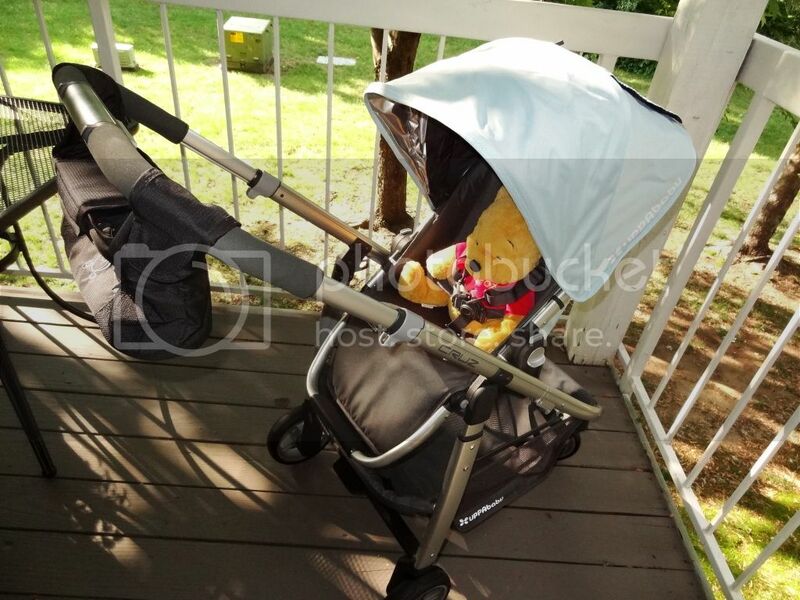 However, it has a reversible seat, adjustable footrest, and mesh magnetic-close window (three big things on my wishlist), as well as an automatic lock, adjustable handle, full-size adjustable canopy with pop-out 50 SFP sunshade, and deep one-handed recline. (Note: While the seat reclines to 180 degrees, the back has a permanent incline so it's not flat-flat. Still, with the infant snug seat, it's approved for babies from birth.). 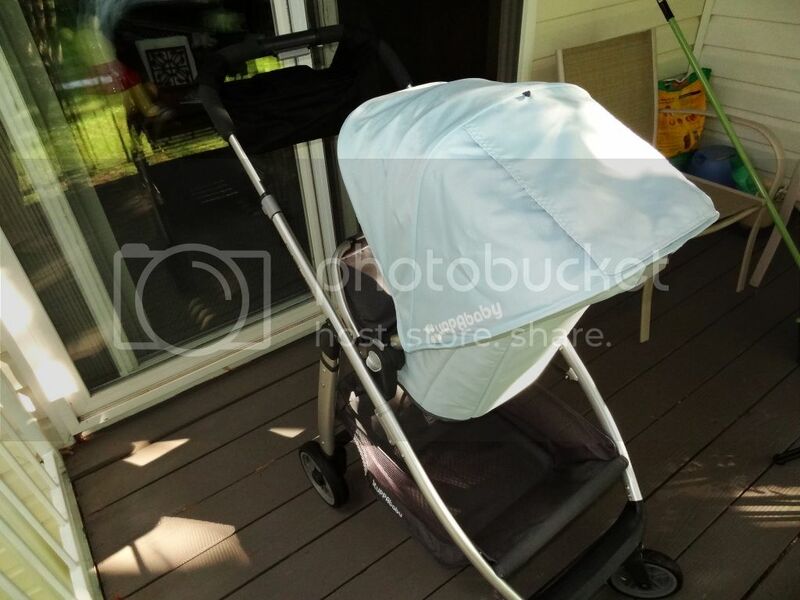 Oh, and it comes in a gorgeous sky blue color which is not available in the Vista and does include a rain cover and mosquito netting, just like the Vista. Because of the smaller wheels and a frame made of slightly lighter material, the Cruz is 3 lbs lighter than the Vista. 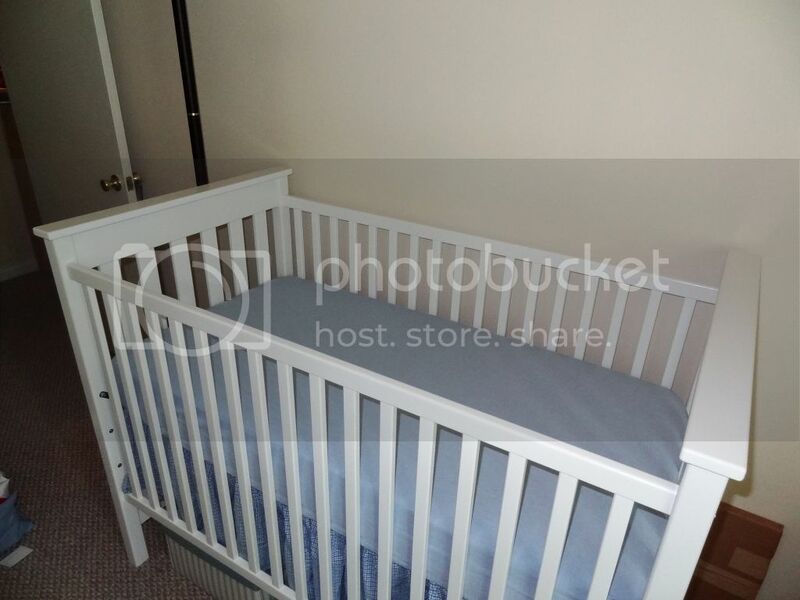 There's also no bassinet to store once baby outgrows it or if he doesn't care for it at all. There's a specific car seat adapter for each of the following brands: Chico, Maxi-Cosi, Gracco and Peg-Perego. 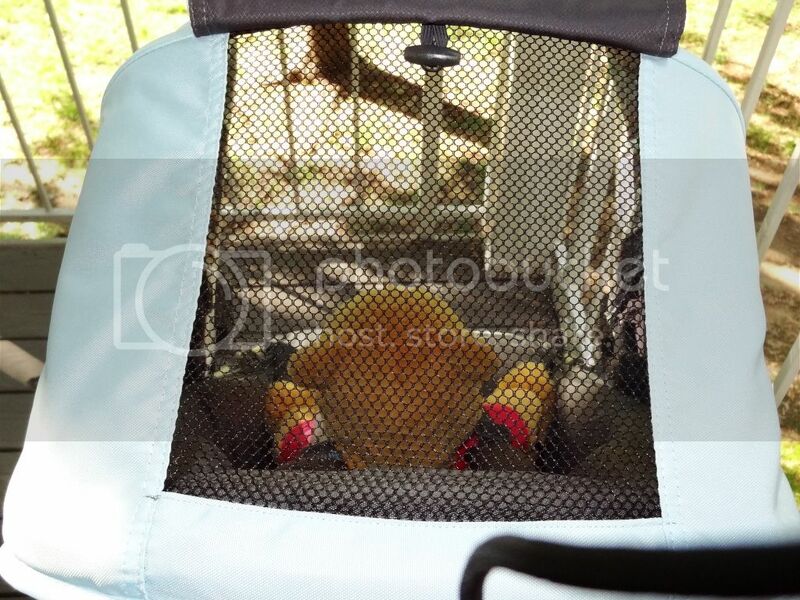 Without further ado, here's the Blueberry's stroller, which Pooh was kind enough to demo for us. 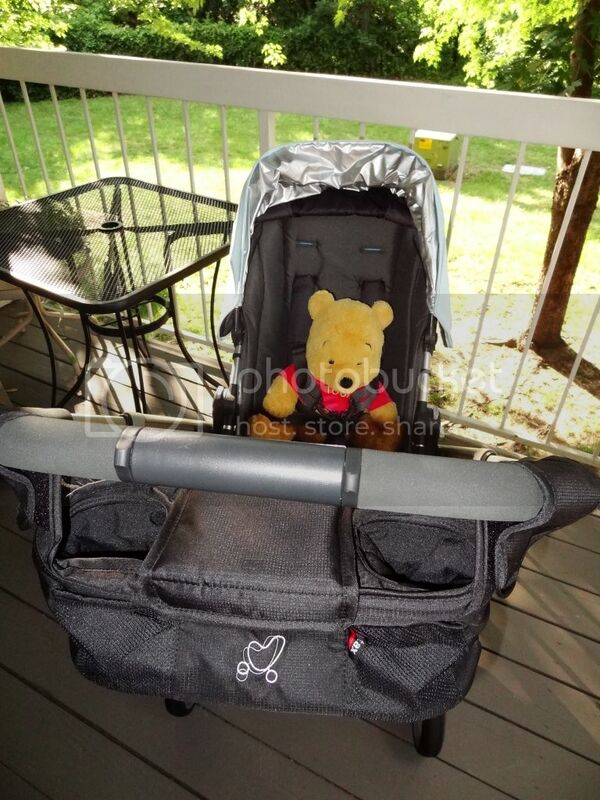 This is the new Britax stroller organizer, which fits perfectly as you can see. 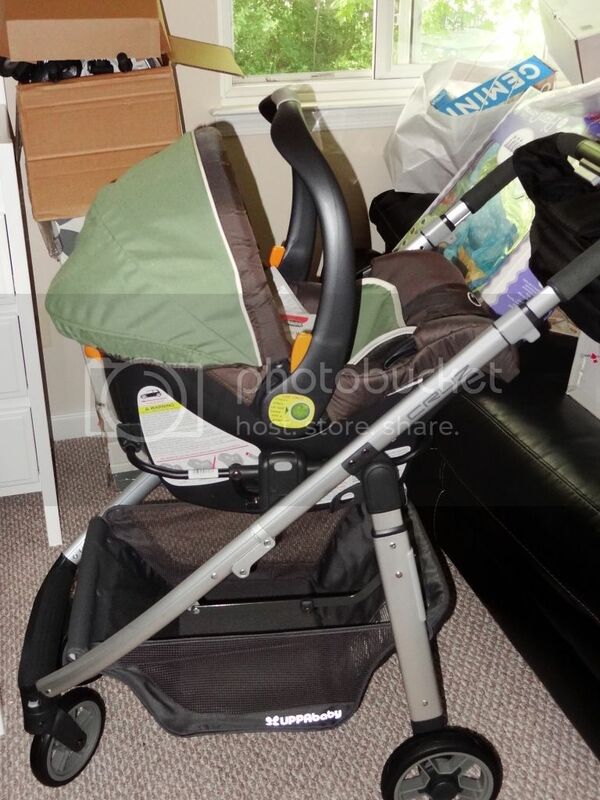 UppaBaby sells their own model, but I didn't like it as well. Mesh peekaboo window with magnetic closures. I hate noisy velcro and really like the idea of the air-circulation that comes with mesh. Here's the Cruz folded--pretty flat I'd say.